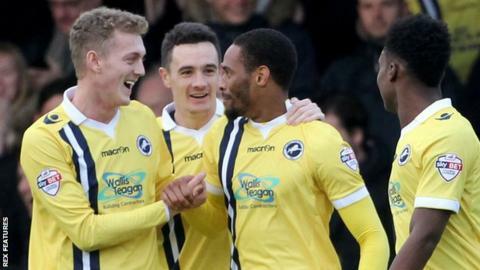 Millwall ended a run of three straight League One defeats by thrashing fellow play-off hopefuls Southend United. Neil Harris' Lions took the lead when Joe Martin's shot went in off the post before Shaun Cummings added a second when his cross evaded everyone and went in via keeper Daniel Bentley. Fred Onyedinma made it 3-0 at half-time by following up Steve Morison's strike. Morison then played in strike partner Aiden O'Brien to score his 10th goal of the season and seal the three points. Southend only had one effort on target in the whole game, with David Worrall's acrobatic effort saved by David Forde, as the eight-match unbeaten run by Phil Brown's side was brought to an end. "I thought we were outstanding. They've set their standards and that's got to be every week. "It's not just about the 11 players that started this fixture, it's about the boys that performed brilliantly in the second half the other day, it's about the guys that weren't in the squad today coming back into the fold. "I'm delighted, I thought from the goalkeeper through to the front line we were excellent and the disappointment was that we didn't score more goals. "We've got to stick to the same standards, the same discipline when we haven't got the ball." Match ends, Southend United 0, Millwall 4. Second Half ends, Southend United 0, Millwall 4. Foul by Joe Pigott (Southend United). Shaun Williams (Millwall) wins a free kick in the defensive half. Corner, Millwall. Conceded by John White. Corner, Southend United. Conceded by Joe Martin. Substitution, Millwall. Alfie Pavey replaces Steve Morison. David Mooney (Southend United) wins a free kick on the left wing. Substitution, Millwall. Shane Ferguson replaces Fred Onyedinma. Stephen McLaughlin (Southend United) wins a free kick on the left wing. Foul by Shaun Cummings (Millwall). Attempt missed. Steve Morison (Millwall) right footed shot from the right side of the box is too high. George Saville (Millwall) wins a free kick on the left wing. Substitution, Millwall. Ben Thompson replaces Aiden O'Brien. Attempt blocked. Ryan Leonard (Southend United) right footed shot from outside the box is blocked. Will Atkinson (Southend United) is shown the yellow card for a bad foul. Joe Martin (Millwall) wins a free kick in the defensive half. George Saville (Millwall) wins a free kick on the right wing. David Mooney (Southend United) is shown the yellow card. Gary Deegan (Southend United) wins a free kick on the left wing. Attempt missed. Joe Pigott (Southend United) right footed shot from outside the box is too high from a direct free kick. Jack Payne (Southend United) wins a free kick in the defensive half. Goal! Southend United 0, Millwall 4. Aiden O'Brien (Millwall) left footed shot from the centre of the box to the bottom right corner. Assisted by Steve Morison. Joe Pigott (Southend United) wins a free kick on the left wing. Corner, Southend United. Conceded by Byron Webster. Attempt blocked. Joe Pigott (Southend United) right footed shot from the right side of the box is blocked.